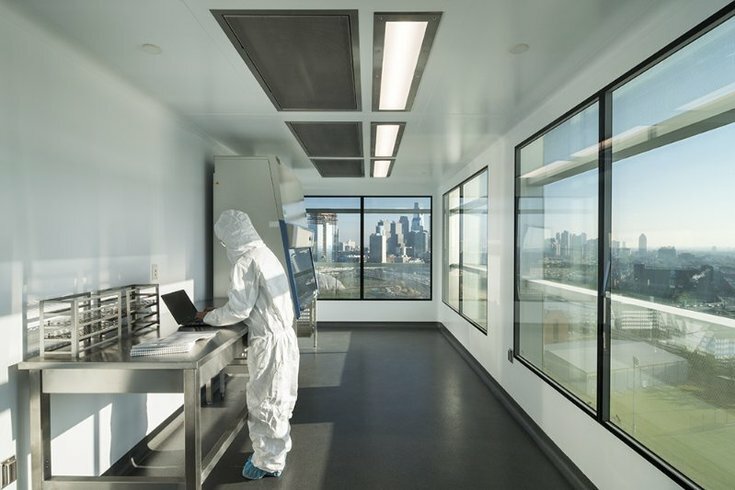 A scientist works inside the new Novartis-Penn Center for Advanced Cellular Therapeutics, a $27 million research center for personalized cancer treatments. The University of Pennsylvania has unveiled a new, $27 million center on its medical campus that will be devoted to developing cutting-edge personalized treatments for cancer. "This new center is going to double our capacity in terms of the number of patients that we can treat in clinical trials at Penn, at the Children's Hospital of Philadelphia and collaborating institutions," said Dr. Bruce Levine, director of the new Novartis-Penn Center for Advanced Cellular Therapeutics. The center will focus on CAR (chimeric antigen receptor) T-cell therapy, an experimental cancer treatment that has gotten an "explosion of interest" from researchers and pharmaceutical companies around the world. The therapy involves taking a patient's T cells, a key component of the immune system, and splicing them with different genetic materials so that they can be optimized to destroy cancer cells. Think of it like a comic-book storyline where an ordinary person gets turned into a superhero through genetic engineering — only in this case, it's the T cells that get special powers. "What we're doing is taking a patient's own immune cells and engineering them so they can hunt down cancer and kill the cancer," explained Levine. Patient Bill Ludwig understands the power of the therapy better than anyone else. He was the first person to sign up for a CAR therapy trial in 2010, though he had no hope of curing his leukemia. He attended the ribbon-cutting ceremony for the new center on Tuesday — five years after treatment and still cancer-free. Not all results have been that miraculous, but stories like his are part of the reason that Swiss pharmaceutical company Novartis agreed to a licensure agreement with Penn in 2012 and invested $20 million in the center. The Food and Drug Administration has even granted "breakthrough" status to the most promising CAR therapy for leukemia, putting it on the fast track for approval. Novartis is racing against dozens of competitors to successfully develop the therapy. "There are upwards of two dozen companies all over the world in various sizes looking to develop this technology in different types of immune cells," said Levine. More than 100 specialists will work at the center, creating treatments for up to 400 patients per year. There's more than 23,000 square feet of lab space, including 6,300 square feet of contaminant-free "clean room" space for cell engineering. Penn will only work on the first phase of clinical trials for new cancer therapies. After that, they'll hand the work over to Novartis scientists, who will conduct the large-scale, international trials necessary to get treatments on the global market. If all goes according to plan, therapies for lymphoma and pediatric leukemia will get FDA approval by 2017. 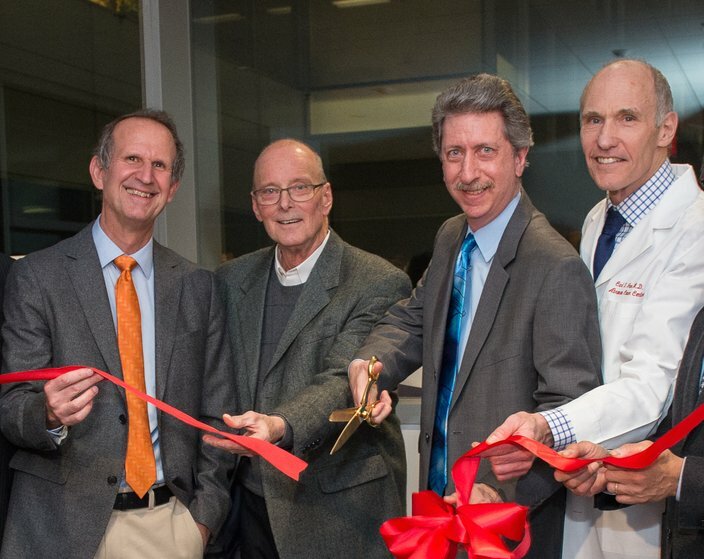 Bill Ludwig, center left, and Dr. Bruce Levine, center right, cut the ribbon on a new advanced cellular therapy center. Dr. Glenn Dranoff of the Novartis Institutes for Biomedical Research and Dr. Carl June of Penn's Abramson Cancer Center stand at far left and right, respectively. The technology has even gotten the attention of Vice President Joe Biden, who toured Penn's facilities last month as part of his "moonshot" effort to fight cancer. While in Philly, he met young Emily Whitehead, who was the first child to get a CAR treatment for leukemia at the Children's Hospital of Philadelphia. "She was our very first child who was treated. She was diagnosed in May 2010 [at age 6], relapsed twice, came to Children's Hospital in early 2012 and received high-dose chemotherapy that would kill an adult," said Levine. "And she still had her bone marrow packed with 70 percent leukemia." Emily got the CAR infusion but nearly died from the intensity of her body's response as the T cells waged a war on the leukemia cells. When the war was over, however, doctors were shocked at the results: The cancer cells had disappeared. "When she woke up, her dad said, 'Emily, you did it, there's no leukemia,'" remembered Levine. "And her first words were, 'That's what I do.'"